Section 1. Purpose. The education of Western music within institutions of higher learning plays a crucial role in detecting individuals with terrorist ties and stopping them from performing works by great and under-performed American composers such as Vivaldi, Buxtehude and Bach. Perhaps in no instance was that more apparent than the terrorist attack of November 18, 2016 when students at the Juilliard School performed Johann Sebastian Bach’s Mass in B minor on gut strings, when State Department policy prevented education officers from properly scrutinizing the syllabuses of several degrees offered at the Juilliard School and other institutions that regularly subject United States Citizens to “historically informed performances” (hereby known as terrorist propaganda). Numerous U.S. citizens have been implicated in terrorism-related crimes as the lie of historical performance has become a trend in the universities across our land. Deteriorating conditions of musicians’ intonation, employability and ability to simply get along increase the likelihood that terrorists will be able to infiltrate musical performances in our country. Thus, the United States must be vigilant during the degree-issuance process to ensure that those approved for graduation from institutions of higher learning do not intend to harm Americans and that they have no ties to terrorism. In order to protect Americans, the United States must ensure that those admitted to music schools do not bear hostile attitudes towards Western Music and its founding principles. The United States cannot, and should not, admit those who do not support the self-evident truth that A=440, or those who would place violent ideologies about temperament over established aural training curricula. In addition, the United States should not admit those who engage in acts of bigotry or hatred (playing the harpsichord, discussing obscure composers on social media, looking for obscure composers on social media, making up obscure composers to discuss on social media, or otherwise capitalizing on general American ignorance) or those who would oppress Americans of any aesthetic persuasion. Sec. 2. Policy. It is the policy of the United States to protect its citizens from U.S. citizens who intend to commit terrorist attacks in the United States; and to prevent the admission of foreign nationals (particularly those from the Netherlands) who intend to exploit United States concert and recital series and for malevolent purposes. Sec. 3. Suspension of Issuance of Degrees in Historical Performance. (a) The Secretary of Homeland Security, in consultation with the Secretary of State, Director of National Intelligence and Secretary of Education shall immediately conduct a review to determine the information needed from any instution to adjudicate any degree, admission, or other benefit under the INA (adjudications) in order to determine that the individual seeking the benefit is who the individual claims to be and is not a security or public-safety threat. Sec. 4. Suspension of the education on matters of Historical Performance. (a) The Secretary of Education will conduct a review of the education on historically informed instruments to determine if any of those studying them and teaching them is a public safety threat. Those found to be a threat to national security will be reported to the Office of National Intelligence and a secondary review will be conducted by the House Un-American Activities Committee, co-chaired by Garrison Keillor and Anthony Tommasini. (a) Oboes d’Amore shall be replaced by party horns. (b) Baroque Violins by one set of Halloween nails and one chalk board. (c) Theorbos shall be replaced by ukuleles. (d) Harpsichords shall be replaced by the Casiotone 201. (e) Violas da Gamba shalle be replaced by handsaws. (f) Recorders shall be replaced by candy Whistle Pops. Sec. 7. The implementation of uniform practices in the performance of Johann Sebastian Bach’s music. Phrasing, musical sensitivity and any acknowledgement of history or fact (erreoneously labelled “critical thought”) will be actively curtailed by the Office of Homeland Security. Those found using agogic accents, lowered thirds or paired fingerings will be immediately removed from their positions in institutions of higher learning, and sent to one of several reeducation facilities where they will be instilled with the virtues of Leopold Stokowski, Charles Rosen and other denizens of American Luddite greatness. Sec. 8. Realignment of the U.S. Musician Admissions Program for Fiscal Year 2017. (a) The Secretary of State shall suspend the admission of foreign musicians for 120 days. During the 120-day period, the Secretary of State, in conjunction with the Secretary of Homeland Security and in consultation with the Director of National Intelligence, shall review musician visa application and adjudication processes to determine what additional procedures should be taken to ensure that those approved for admission do not pose a threat to the security and welfare of the U.S. concert goers, and shall implement such additional procedures. (b) Pursuant to section 212(f) of the INA, 8 U.S.C. 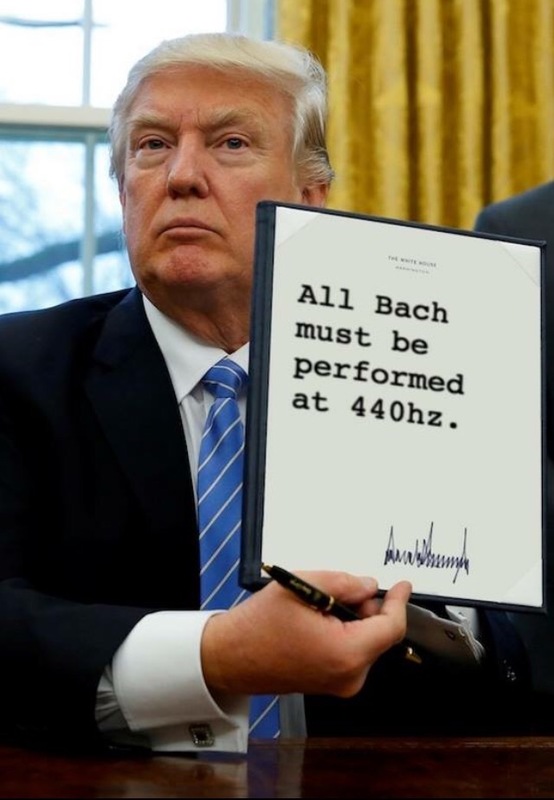 1182(f), I hereby proclaim that the entry of musicians from the Netherlands is detrimental to the interests of the United States and thus suspend any such entry until such time as I have determined that sufficient changes have been made to ensure that admission of Dutch musicians is consistent with national interest in the performance of Johann Sebastian Bach. Sec. 9. The Secretary of State shall, within one year of the date of this order, provide a report on the estimated long-term benefit to the subscription base to Pro-American organizations such as the Chamber Music Society of Lincoln Center, the Metropolitan Opera of New York and the Boston Symphony Orchestra, as well as to the general benefit in the performance of Johann Sebastian Bach by pianists and violinists across our great land. Visit www.harpingon.live for more whims and wanton wanderings on music and life!